This is little blind Callie, who came to us from the Bitterroot Humane Association on December 1st. (See original post here.) I took this photo just a few minutes ago this evening. 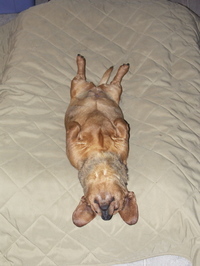 Clearly this is one stressed-out Dachshund. She also assumes this position when it's time to go outside for the last time at night, and rather than get up off the bed, she rolls over on her back and ignores us. She lays completely still, upside down, pretending she can't hear us ... except every time we call her name, her little tail twitters faster and faster. Happy Holidays to every creature on the ranch ! Good to see Callie isn't stressing. Callie is not stupid, it is so nice and warm and cozy inside and so COLD outside! Doesn't it feel good to make them happy? Merry Christmas to everyone at the Ranch!